Driving home each day I pass this maple tree. Vibrant colour glows, even on a grey day. The carpet of leaves underfoot grows thicker each day, in proportion to the growing visibility of the tree's skeleton. I know I need to be quick if I want any pictures. So today, in spite of a constant drizzle, we set out for our walk, camera in hand. Correction: camera in protective case. I snapped photos, admiring the pinkish red of the leaves, paler than I remember from other years, but still so beautiful. More reds along the bog pathway: bog cranberries and blackberry leaves. As Faith Baldwin says, "Autumn burned brightly, a running flame through the mountains, a torch flung to the trees." In spite of the soggy weather, the trees did burn with colour. As we walked we could almost hear the slurping as trees, grass and ground drank in the much-needed water. Perhaps no one is happier for this wet weather than the ducks. The long dry spell left them without a pond to swim in. After a couple of days of rain, the bog pools are filling up. Ducks quack and paddle, utterly content in the rain. As for us, we arrived home wet, to the savoury scent of roast chicken. Roasted sweet potatoes, sauteed tomatoes, and a gratin with the last of the garden zucchini made for a fine meal. Dessert was apple crisp with custard sauce. Ah, autumn food! Linking to Mosaic Monday, hosted by Mary at the Little Red House. We have also had rain, and so lovely. I am hoping for snow this year, as the garden would love some moisture and the plants a good freeze. I think they missed it last year. Sometimes I think the leaf color is even more strking when it's a gray or rainy day. You photographed these nicely and it does give a "mood" to the photos! Our rain is arriving tomorrow-- I hope, as we need it. The red maples are so beautiful and I see more and more being planting in our neck of the woods. I love the colour and miss it from our time in the east. What a beautiful afternoon you must have had! Beautiful colors on the maple. Rain here too this weekend. Yipee! I agree that the colors look even more beautiful on a gray or rainy day. Your trees are gorgeous, we are to have rain today. Love the duck shot, they do not mind the rain. Lovely Autumn photos, thanks for sharing. very lovely colors on the maple..we had rain here too..i think more are coming too. What a gorgeous color you have shared! It's amazing how such a dramatic change for a tree can be so wondrously bright! A lovely walk and a delicious dinner! That's my kind of day! Rain! We FINALLY had a little two days ago too but I have no beautiful photos from it. Your walk was so pretty. Beautiful colours! I think we were all ready for the rain this time. Great shot of the ducks enjoying it! It's like the coolness of the rain brought out the colors! So great o see you enjoy the outside and the inside ... with family, crafts and wonderful cooking! I feel like I just had a little visit! Thanks for sharing the pretty Fall colors in your part of the country. Starting to get a little color here, but not a lot. Now that is the red I'm always looking for...have seen precious little of it this year. It's really getting pretty over there. Hope that the rain is gentle and that the sun will come out soon so that you can enjoy those wonderful colors all the more. It's still raining here. Rain, rain, and more rain. We're bookends these days I guess. 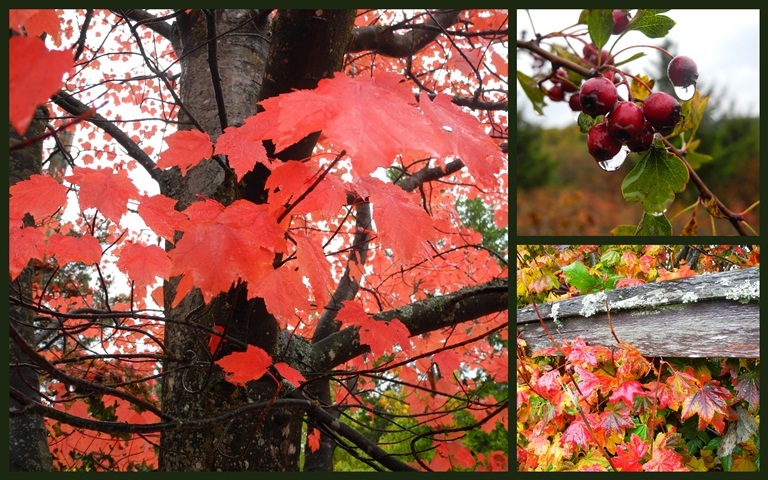 the beautiful fall colours certainly brighten up a dull wet day. I am always amazed by the colours of your fall - it is something that we don't have here. Have a wonderful week and thank you for stopping by my blog to say hi. ps - I have dehydrated chill-con-carne too, and it also worked out well. Don't you just love camping without crowds? Maples so beautiful at this time of year. Had not realised that you were in need of rain Lorri.